A very fun morning catching sharks and triple tail with Phillip, Chase and Brendan! Big shark of the day was a 7 foot bull!! Posted in Fishing Charter Pictures	| Comments Off on Texas Boys Sharkin’!! Bonding Time and Redfish Today!! These kids were great and the dads were awesome to share this experience together and make some memories!! Posted in Fishing Charter Pictures	| Comments Off on Bonding Time and Redfish Today!! More Redfish today in the high winds and muddy water! Carl, Chris and Kurt showing off some of the nicer redfish from today! They also caught 10 white trout! Posted in Fishing Charter Pictures	| Comments Off on More Redfish today in the high winds and muddy water! Heck of a Redfish Day for these Boys! We couldn’t get after the tarpon because of the wind so we switched gears and caught some redfish, trout and flounder!! Posted in Fishing Charter Pictures	| Comments Off on Heck of a Redfish Day for these Boys! Hookin’ Tarpon, Triple Tail and Sharks!! Jumped 2 tarpon that broke us off, caught 4 triple tail and several sharks this morning with Mike, David and Will!! Posted in Fishing Charter Pictures	| Comments Off on Hookin’ Tarpon, Triple Tail and Sharks!! Big Triple Tail, Sharks and Jacks the last two days! Posted in Fishing Charter Pictures	| Comments Off on Big Triple Tail, Sharks and Jacks the last two days! 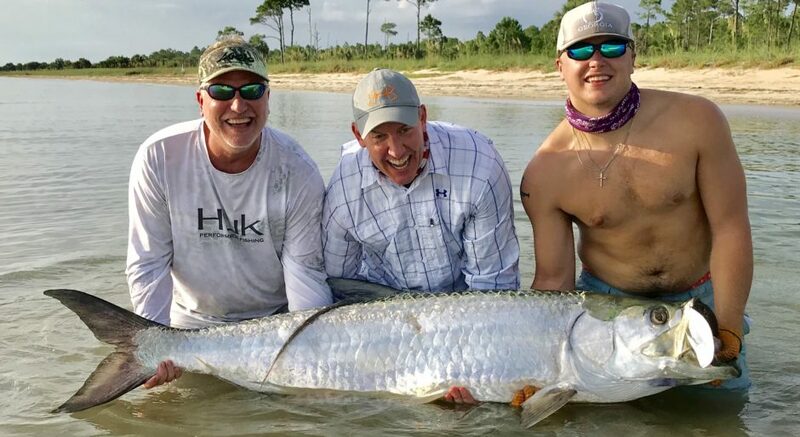 A Big Tarpon for this Texas Family!! Another fun morning chasing the silver king with The Glazener family from Texas!! It was a wish that Jacob got a tarpon for his 19th birthday and his wish came true!! Posted in Fishing Charter Pictures	| Comments Off on A Big Tarpon for this Texas Family!! Tarpon time! Marie did an outstanding job landing her first ever tarpon on the G Loomis E6X rod today!! We jumped two and landed one before the storms rolled in! Thank you Greg, Chris and Marie for fishing with me! Posted in Fishing Charter Pictures	| Comments Off on Tarpon Time!!! Inshore Slam and a Heck of a Storm!! What a day dodging storms and scoring an inshore slam with Gary and Mitchell! Redfish, trout and flounder today!! Posted in Fishing Charter Pictures	| Comments Off on Inshore Slam and a Heck of a Storm!! Kids Charity Fishing Trip was a Big Success!! Posted in Fishing Charter Pictures	| Comments Off on Kids Charity Fishing Trip was a Big Success! !